Hey shoppers! There's more good news coming your way as SM City Sta. 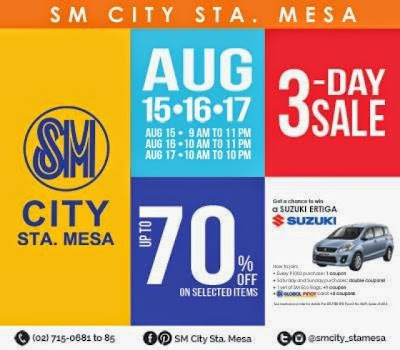 Mesa launches another 3 day sale on August 15, 16 and 17, 2014. Great deals up to 70% off on selected items mall wide can be enjoyed on these dates including current items like jewelry, men and women's apparel, cosmetics, perfumes and tons of gift items from the latest fashion brands from the Philippines and around the world!